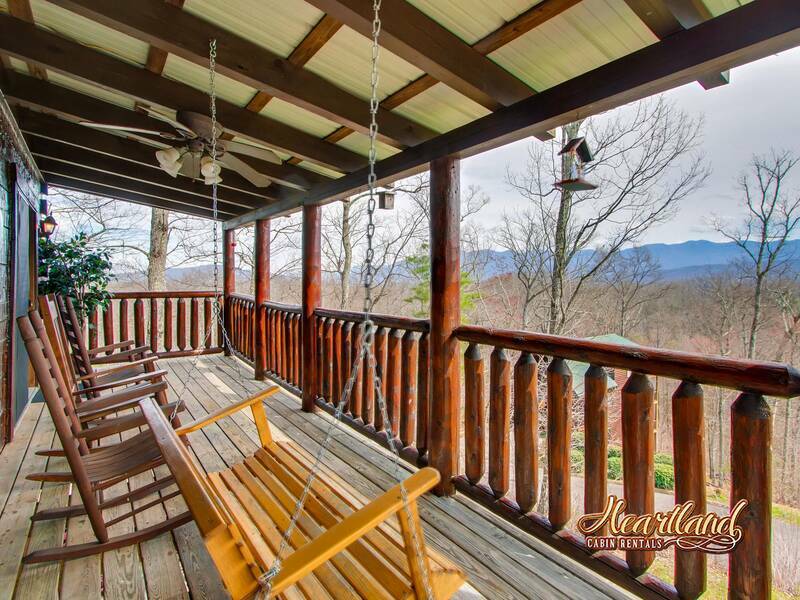 Gorgeous real log constructed house located on a wooded mountaintop lot with a wide view of the Smoky Mountain range to the South. Postcard type views, bring your camera. Enjoy the magnificent close-up views of Mt. 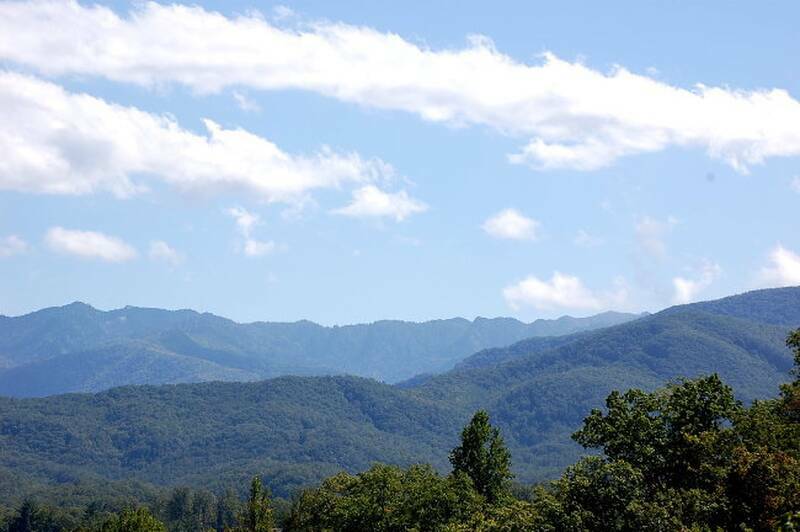 LeConte and the full 180 views of the Great Smoky Mountains. 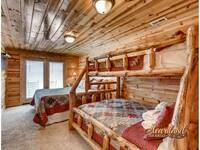 This beautiful cabin is easily accessed from both Gatlinburg and Pigeon Forge. 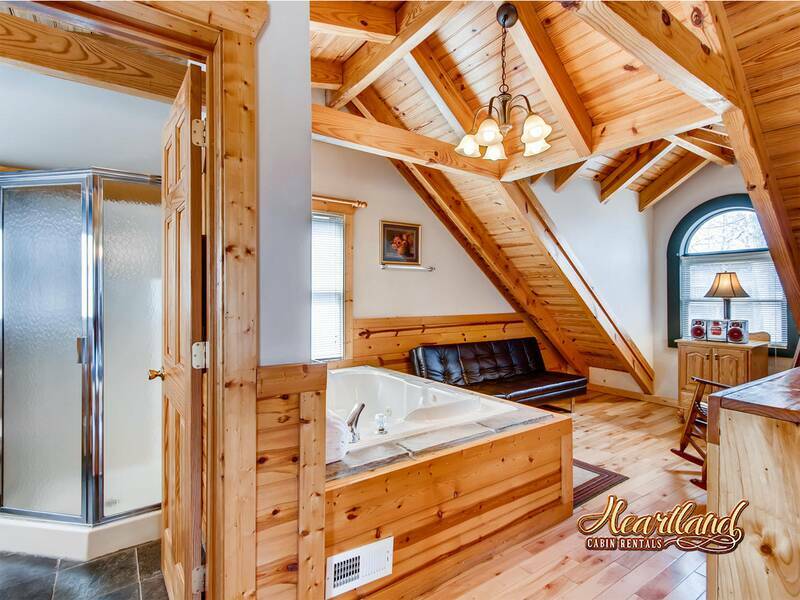 You will find Jacuzzi tubs in the king bedroom baths, New flat screen TVs in all bedrooms, family, living room and game room downstairs for a total of 5. 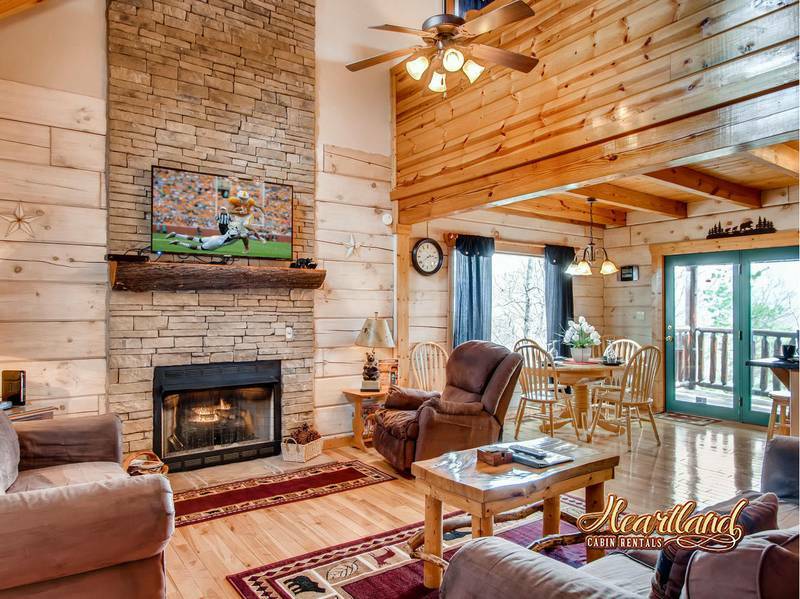 In the winter months, you can relax by the gas fireplace in living room with a large flat-screen TV. 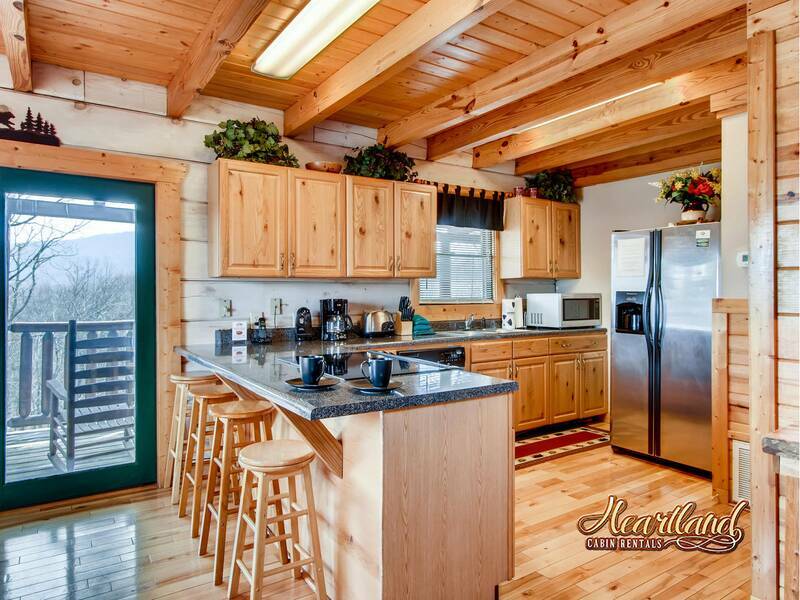 The beautiful fully furnished kitchen is perfect for cooking a meal while on vacation in the Smoky Mountains. Downstairs you will find the game room with pool table and a bedroom with a queen bed and bunk beds. Just outside is a hot tub with a view of the mountains. 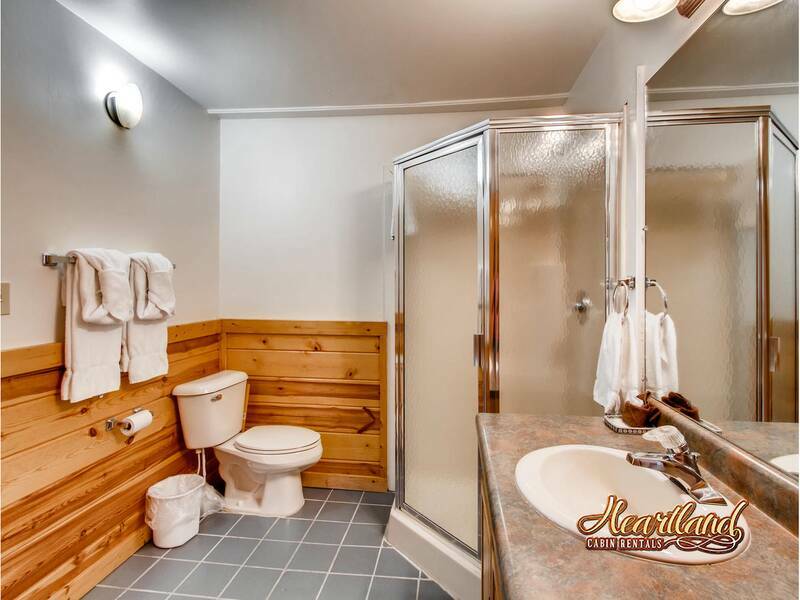 This cabin has access to the outdoor pool is for the exclusive use of the residents of Settlers Ridge and is easily accessed from Stargazer. STARGAZER IS A NON SMOKING CABIN AND NO PETS! We have been staying with Heartland rentals since we got married in Gatlinburg in 2010, and have always had a great experience! And Stargazer was amazing! My 5 boys enjoyed the lower level to play pool, board games and watch DVDs when we weren’t out doing stuff in town. It has a very spacious living room and kitchen, and my husband and I enjoyed the upper loft area and jacuzzi, and the room was very large so we could set up our baby’s pack n play. We will definitely be back to this cabin! Also a special thanks to all the staff at Heartland Rentals for being helpful and just all around great people! Cabin cery clean! Office staff so nice and accommodating with my questions! Book left in cabin for instructions on everything from coming in and leaving very detailed and great! Will definitely come back here! Absolutely enjoyed it. Clean, supplied well, close to town but in the mountains. Interior lovely and quiet. We had a blast. Fireplace was so nice. Only complaint was the shower heads had terrible spray and the hot tub was luke warm. Otherwise perfect! Great views, wonderful location, the right size for a family of 6. Our overall experience with the cabin was a positive one. A few minor details needed some attention but Heartland responded very fast to our concerns. Be prepared for a very steep hill as you approach the cabin. We enjoyed our stay and enjoyed the space for all our family members, however the kitchen table does seat six, but every closely. The layout of the house was beautiful and this house allowed my family to have room to stretch out and have plenty of space to enjoy it and not be right up under each other. We have always rented from Heartland for years and the staff has always been great to work with. We will not go with anyone else. Everything was great and clean! We had a great time and enjoyed our stay here and will come back to the stargazer! It was clean and that’s a plus for me! Had enough room for everybody! This was the second stay in G'burg with our family (kids & grandkids). Everyone agreed it was the best. Beautiful view, nice to see the Smokies fade out and then back in as a storm passed, sitting dry on the veranda. The Stargazer lived up to its moniker when one night I woke up and my bride of 44 years was gazing through the top floor window at a clear sky full of stars. Gatewaay Pass enjoyed most was Annakeesta. The cabin exceeded what we were expecting. The king size bed in downstairs was so comfortable. We all had a wonderful time.